ATLANTA, Oct. 30, 2018 /PRNewswire/ -- GP PRO, a division of Georgia-Pacific and a leading provider of advanced dispensing solutions for commercial facilities, and TOTO USA, the world's largest plumbing manufacturer, today announced a collaboration to deliver the industry's most complete connected restroom management solution. The collaboration is enabled by the KOLO™ Smart Monitoring System, winner of the 2018 ISSA Innovation Award in the Services & Technology category. The system is GP PRO's new open architecture communication platform that provides reliable, customizable and secure monitoring and analysis of connected away-from-home restroom fixtures. "GP PRO has invested two and a half years developing what we believe is the most dependable, insightful and scalable smart restroom communication system available to help facility managers deliver a better restroom experience," said Mike Slawson, vice president and general manager, Restroom Services and Connected Devices for GP PRO. "We are thrilled to introduce this industry-changing innovation, and we are equally excited to work with TOTO as this collaboration pairs two industry leaders known for reliability in a quest to create an unprecedented vision for the restroom of the future." 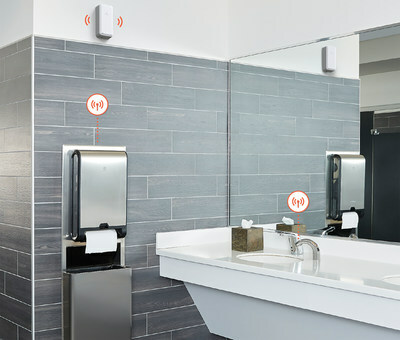 Using secure, proprietary, cloud-based wireless technologies and cutting-edge sensors and sensing technology, the KOLO system allows for timely and customized communication between connected restroom fixtures and facility managers through a mobile and web application. As exemplified through its collaboration with TOTO, the KOLO system's open architecture enables it to integrate with smart devices beyond GP PRO's core product portfolio to provide a more robust and complete connected restroom management solution. "GP PRO is not only a leader in paper products, but, like TOTO, is a leader in innovation—the kind of innovation that powerfully solves real customer problems," said Shinya Tamura, CEO of TOTO USA. "We are excited to integrate GP PRO's KOLO system into our smart sensor hydropower faucets and flush valves and, together, connect the entire bathroom ecosystem so as to improve the bathroom experience for facility managers, custodial staff, and users alike." The KOLO system is currently available on a number of GP PRO dispensers, including select enMotion® and enMotion® Flex paper towel dispensers, Compact Quad® tissue dispensers, and enMotion® soap dispensers, as well as on TOTO's EcoPower® sensor faucets and flush valves. To learn more about the KOLO Smart Monitoring System visit www.gppro.com. Based in Atlanta, Georgia-Pacific and its subsidiaries are among the world's leading manufacturers and marketers of bath tissue, paper towels and napkins, tableware, paper-based packaging, office papers, cellulose, specialty fibers, nonwoven fabrics, building products, and related chemicals. The company operates approximately 200 facilities and employs approximately 35,000 people directly and creates nearly 92,000 jobs indirectly. GP PRO, a division of Georgia-Pacific, manufactures and sells well-known brands like ActiveAire®, Angel Soft® Professional Series, Brawny®, Compact®, Dixie®, Dixie Ultra®, enMotion®, and Pacific Blue™. GP PRO products meet restroom, foodservice, and break room needs for office buildings, healthcare, foodservice, high traffic, lodging, retail, and education facilities, plus a wide range of industrial and manufacturing facilities in North America. For more information, visit: gppro.com. TOTO USA is headquarters for the Americas Division of the TOTO Global Group, which was established in 1917 with the founding of TOTO Ltd., in Kitakyushu, Japan. TOTO is the world's largest manufacturer with $5.2 billion in annual sales (as of March 2018). For over 100 years, TOTO has been the recognized leader in innovation, technology, performance, and design with products that enhance the luxury bathroom experience. Today, the company maintains approximately 32,000 employees in 19 countries and owns manufacturing facilities around the world. Winner of numerous domestic and international awards, TOTO is the only plumbing manufacturer honored as Water Efficiency Leader by the U.S. Environmental Protection Agency. TOTO has advanced the plumbing industry with products such as the NEOREST Intelligent Toilet, WASHLET personal cleansing system, EcoPower hydropower sensor faucets and flush valves, and Tornado flushing system to name a few. For more information, consumers may visit www.totousa.com or call 1.888.295.8134, Option 5.